So when should you start caring for your new carpet? At Carpetright, we believe it starts before you even buy it! You can make sure your carpet doesn't receive undue wear and tear by choosing the best one for your needs. Think about how much traffic there’ll be in the area. Will you be eating or drinking there? We say this because it could well be a factor in deciding on which fibres you choose and even the colour. Once you’ve got the carpet in, use mats at all entrances to your home. This prevents dirt and grit from being brought in and walked in to your carpet. Vacuum your carpet regularly at least two or three times a week. The recommendation is that loop pile carpets are vacuumed with a low level cylinder cleaner using the suction head only, cut pile carpets should be vacuumed with an upright cleaner with beater bar and brush. To keep your carpet in tip top condition you may want to consider professional cleaning maybe once every year. It really helps to clean up spills immediately, especially liquid and prevent them from spreading by always cleaning them from the outside edges inward. Any liquid should be blotted with a clean, dry, white absorbent cloth or paper towels. Please don’t scrub your carpet at the spill, as you can damage or distort the pile. Apply pressure to the cloth until the spill is dry. If the stain remains, it may be necessary to use a stain remover. It’s best to look for a cleaner specifically formulated to handle the type of stain you have. This occurs when the pile changes direction resulting in the creation of light and dark patches on the carpet. It can happen with every kind of carpet, whatever the construction, but may be more visible on plain carpets. It is a completely natural phenomenon, not a manufacturing fault and nothing to worry about. Can you help prevent flattening in your carpet? You can if give it a vacuum regularly. It's also a good idea to occasionally move the position of your furniture a little, so that all of the weight isn't concentrated on one spot all the time. Castor cups can also prevent flattening. Ever notice a jumper whose surface has broken out in small balls of fibre? Well that’s called pilling and the same thing can happen to your carpet – especially if it’s the small loop pile variety. You can deal with pilling effectively by just snipping the bobbles off with scissors. Should you be worried about shedding? Well, most carpets made with spun yarn lose some short, excess fibres when they're first fitted. This shedding is perfectly normal and nothing to worry about. More importantly, it’s definitely not a sign of a faulty or defective carpet. After vacuuming several times, the shedding stops completely. If you would like a wool carpet but are worried about shedding, opt for a wool and synthetic mix which will reduce the shedding. Is fading preventable? Fading on carpets (particularly wool) is caused by exposure to ultraviolet light and is speeded up when sunlight shines directly onto the carpet. This has the effect of lightening or bleaching the colour in your carpet. You can prevent it by reducing exposure to direct sunlight just as you would protect other furnishings. 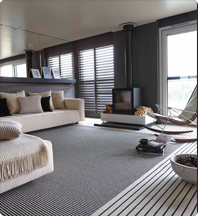 Once you’ve settled on the perfect carpet, it’s a really good idea to think about underlay. Underlay helps protect your carpet against point loading depressions made by heavy furniture and household fittings, whilst also helping the carpet to recover more quickly. New carpet underlay also provides excellent insulation. It’ll help keep your home warmer and reduce fuel bills, whilst intrusive noise levels can also be reduced greatly from adjoining rooms.